Nala is Reunited With One of Her Puppies and Her Foster Mom Kate! – Welcome to The Fantastic Tails Website! Nala is Reunited With One of Her Puppies and Her Foster Mom Kate! 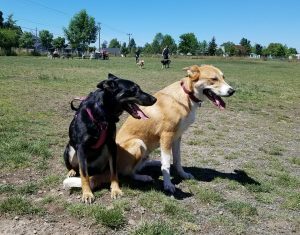 Emma and I were so happy to find Nala’s Foster Mom Kate and have a chance to reunite them and one of Nala’s puppies Benson at a local dog park! There is a story behind this awesome event that we want to share with you right after we show you this picture of our group all together! Nala’s Foster Mom Kate, Uncle Rob, Emma & Her Parents, Nala, Nala’s Puppy Benson & His Adopted Family! While Emma and I were writing the book Nala’s Adoption Adventure we would talk about how cool it would be to get together with Nala’s Foster Mom to let her see Nala again and to give her a signed copy of our book! 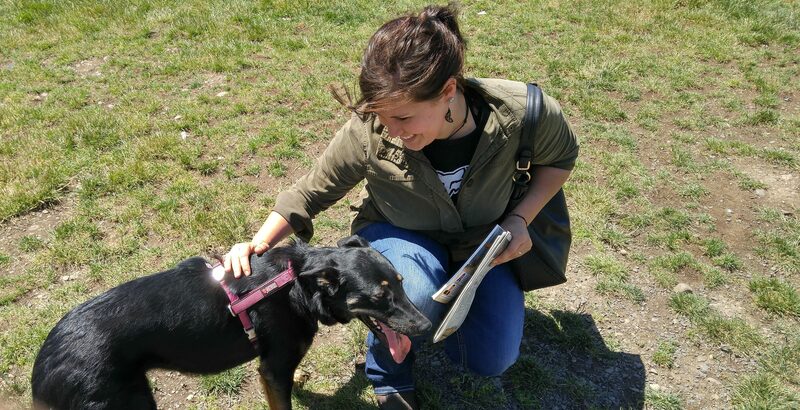 One day while doing research on the links in the book, Emma found Lucky Paws Rescue on Facebook (the rescue shelter that we adopted Nala from) and recognized Nala’s Foster Mom Kate as one of the people that worked with Lucky Paws! We were super excited to know that we had found Nala’s Foster Mom (we didn’t think that would ever happen!) and when we reached out to her, she was excited to see Nala again and to get a copy of the book as well! We had told Kate that she was a very important character in the book as the foster parent of rescue animals is a hero in our book! There is a Facebook page for people who adopted Nala’s puppies and when we reached out to them to see if any of them could make it to this rescue dog reunion Benson and his family responded that they would be there! 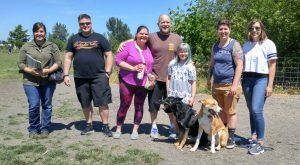 It was a beautiful day at the dog park and we were so grateful for Foster Mom Kate and Benson’s family for making it out to visit! It was truly a dream come true for Emma and me to be able to give our hero Kate a copy of the book Nala’s Adoption Adventure and to also have Benson and his family there to share in this wondrous occasion that celebrates the importance of adopting shelter animals as pets and saving lives! Nala and her Puppy Benson Smiling and Relaxing on this Beautiful Day at this Shelter Dog Family Reunion! Making Our First Donation From Book Sales To Lucky Paws Rescue! Emma Phipps Reads “Nala’s Adoption Adventure” at the Eugene Public Library!